This is up one and a half percentage points on the previous year, and for the first time exceeding the target of 50%. (definitions for recovery and caseness are shown in the panel below). 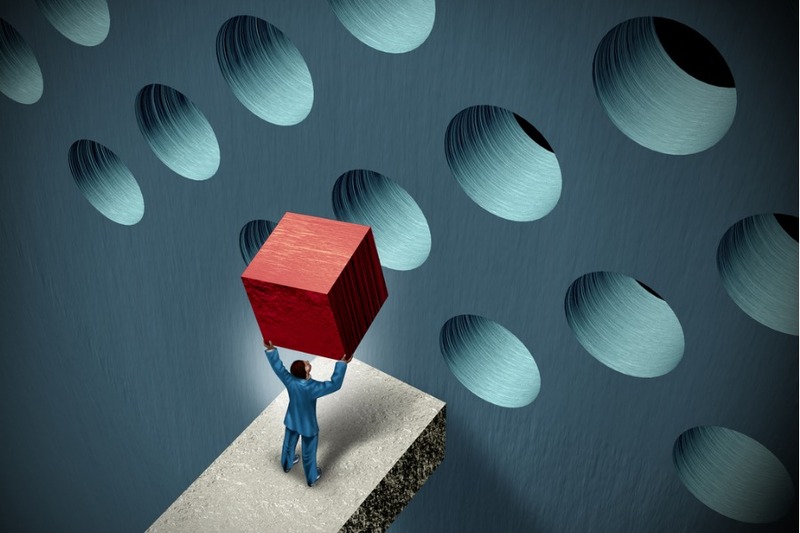 Next articledropoutAre psychotherapies with more dropouts less effective? Square pegs, round holes. What cost conformity? Appreciate the work you put in to ‘lift the veil’ on this stuff! I also wondered about the referral numbers and attrition, and was interested whether this was an IAPT referral that made it through to step 3 (ie those allocated to step1/2 and groups would count as attrition), or whether it was genuine attrition from step 3 alone? Hi Justin and thanks for your post. I’m not sure if I can fully answer your question, but historically the reporting seems to have distinguished between referrals and people. 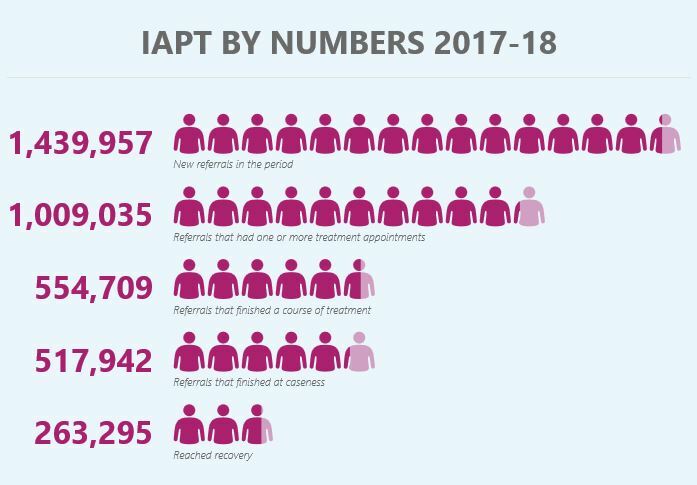 • 1,198,952 people12 referred to IAPT care providers. That clarification is missing from the 2017-18 report – I can see the figure for referrals but not people. So my best guess is that the report includes all referrals into all steps, and classes a step up or down as the closing of one case and the opening of another. From step 3 alone? I’m afraid the report just doesn’t go into that level of detail, but it would be very interesting to know. You can by the way make enquiries as I have done in the past, to enquiries@nhsdigital.nhs.uk Let me know if you do! I am really happy that I found your article on LinkedIn. Last summer IAPT was heavily plugged in the Netherlands, up to government levels, under the name Therapiewinst (‘Therapy Profit’). I was suspicious of the claims that were made by the British researchers, but couldn’t get a complete picture. The facts you present are really helpful for the discussion in the Netherlands, hopefully we can learn from the mistakes made by IAPT. Thank you so much for your comments. I hope that we too can learn from the mistakes made by IAPT! It’s important to acknowledge that there are some excellent local services, but overall we have more to learn than we have to teach. Feel free to contact me if I can help further. I’ve worked in Mental (ill) Health services for decades and have been IN IAPT from the start. The use of the word ‘recovery’ to describe how someone scores on a tick box self assessment is ludicrous and I wonder how did it ever come to this. Service funding, micro management and the mass burnout of staff are all linked to these two measures its like the twilight zone. IAPT is more akin to a production line of suffering that is harming staff and doing very little for the people its meant to help – how can it? 6-10 x 50 minute sessions with a stressed out therapist that at worst ignores the toxic context/culture of people lives and at best reduces it to a mere trigger for some internal issue. Of course some people feel comforted and helped by therapy but this is not surprising given the alienation, fear, and stress people are living with – if we had more time for each other, more time to listen, connect and be – to live in mentally healthy cultures then these services would vanish and I for one would much rather change my career than help to maintain a toxic culture while encouraging people to be responsible to adjust to it rather than change it. Dave – thank you so much for your comments and the passionate way you’ve expressed them. I think your concerns are echoed by many others and your personal experience is telling. In some ways I think what we’re seeing now was perhaps inevitable, given the political imperatives behind IAPT as well as the way it’s been set up. 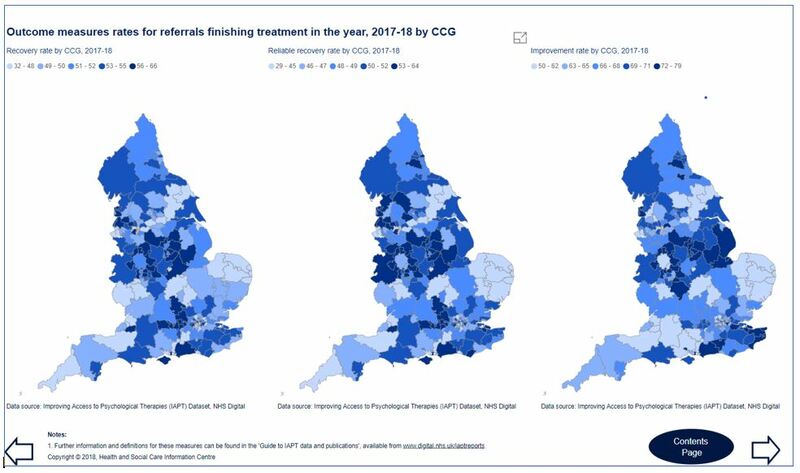 Services before IAPT were far from perfect, especially in terms of geographical spread. But I worked with some stunningly good services from which we could alllearn. Many of those were swept aside to make way for IAPT sadly. I think the reality of life in many IAPT services today and the pressures on staff show up clearly in the data. All predictable and all avoidable. May I wish you well in finding a good fit for your passions!